There are fresh noises in the night. Nobody understands you and lessons are dull. But that's normal. It was a nice school. So what happens when everything changes? There are new teachers and strange events start. Imagine you see a ghost and no-one believes you. 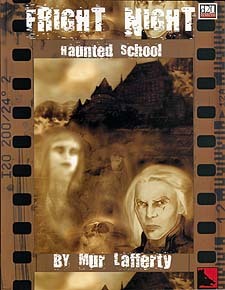 Welcome to Fright Night: Haunted School where your school meets dark forces with you in the middle. You are fifteen. What holds the key to the mystery of Athena Academy? School was never this frightening.